A number of the campsites contain a layer of very fine dust that for the majority of nights doesn’t present a problem; and then the wind blows. The first night camping at Redbank Gorge we had wind gusts exceeding 50km/h (30m/h). We awoke to find a fine layer of red dust covering everything inside our tent, including us. This dust managed to successfully jam my Petzl E+ Lite, and down jacket zip. For the next two weeks turning my headlight on involved blowing sharply on the switch mechanism each time I needed to move the activating lever. Other hikers we talked to also raised the same issue for two of the other campsites. If you ask my friends and family to describe my choice of leisure activities the terms most often used would be ‘spontaneous’ and ‘crazy’; you want to hike how far, for how many weeks? Until recently I would have agreed, at least as far as the spontaneity is concerned. However, in the past few years I have come to realise that all my great adventures have started with a random thought that progressively builds over months, or typically years, until I finally act. 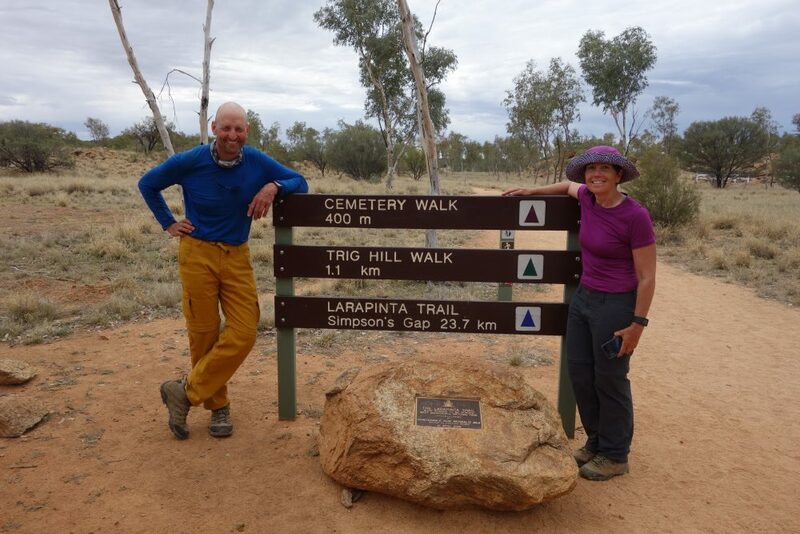 Our hike of the Larapinta Trail started as a conversation with work colleagues in 2014 and concluded in August 2016 with our 14 day west-east trek. How long should we take? 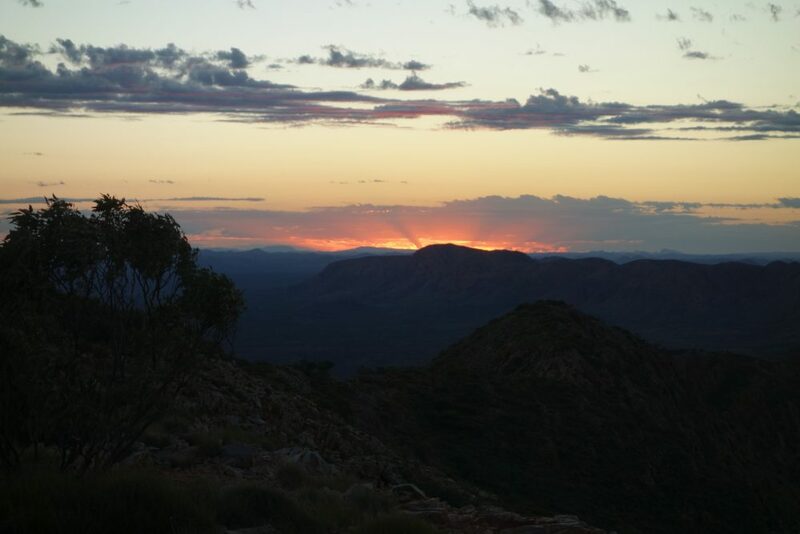 Some very hardy people choose to walk Larapinta in the hot months; usually walking early in the day, and late in the evening to avoid the extreme UV and heat in excess of 40 degrees Celsius (104F). This greatly increases the risks to personal safety and should only be attempted by highly experienced and fit hikers with a meticulous plan and backup. However winter is considered the best time to travel with August usually being the driest winter month and that is why we decided to go in August. We also decided on a 15 day schedule based on our level of fitness, logical camp sites, known speeds with a full pack, and the fact that this was meant to be a leisure activity (thanks for the reminder Gill!) as opposed to a ‘take no prisoners approach’ (Tim). We travelled west-east being dropped off at Redbank Gorge on the 1 August. 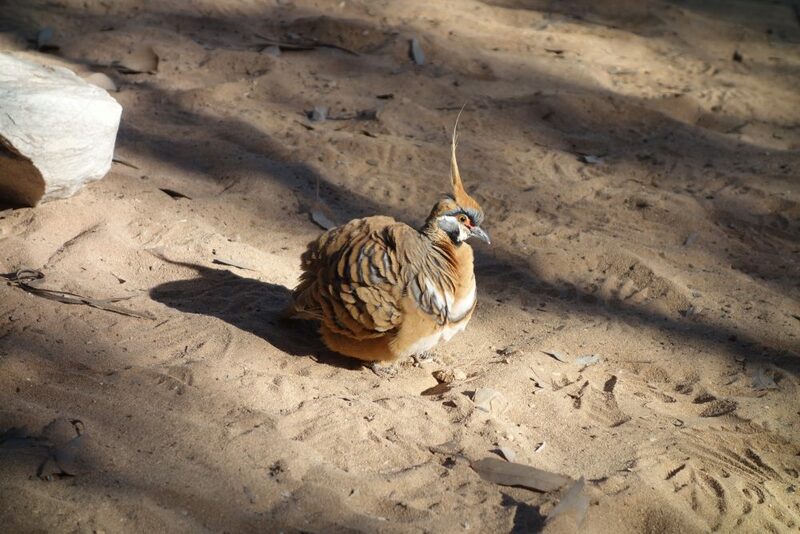 This meant that we could vary our schedule and either extend or reduce the number of days we had planned provided we returned to Alice Springs in time for our flight home. 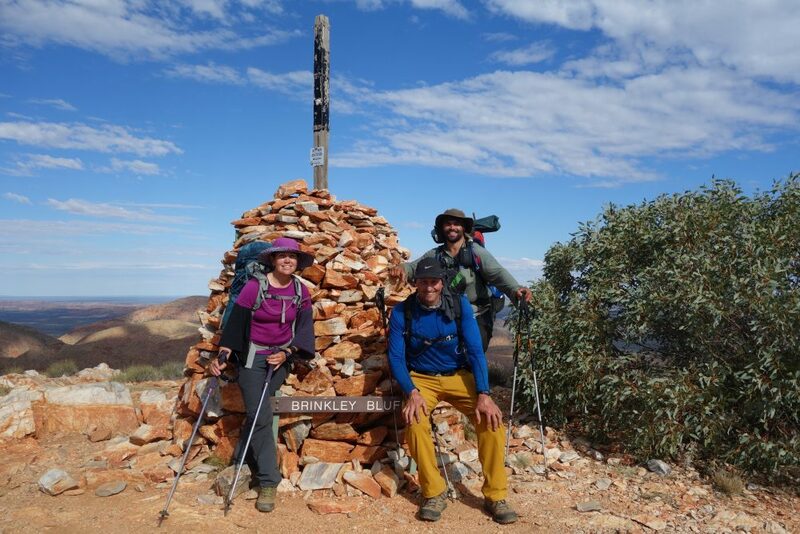 The Larapinta Trail is designed to start in Alice Springs and finish at Mt Sonder and as such the difficulty ratings attached to each of the 12 sections in the printed brochures and the guidebooks are based on this. But there were discrepancies between the various sources. 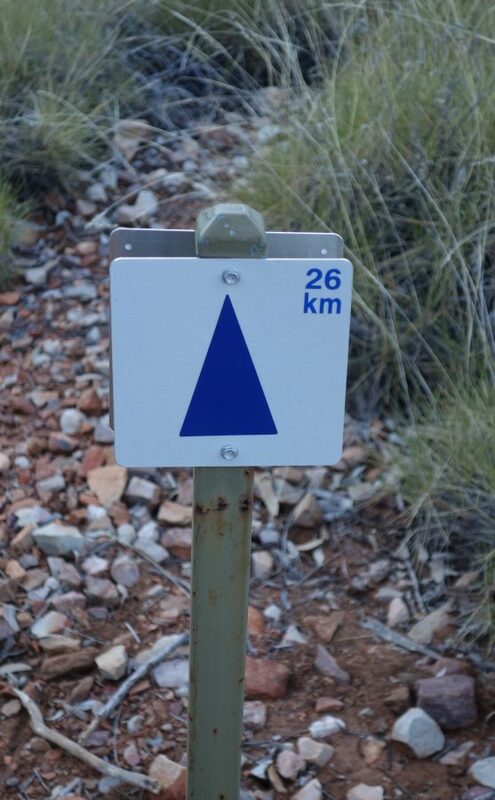 We found that doing the trip in ’reverse’ meant that the difficulty rating provided in the section pamphlets by the local parks authority indicates that the hardest sections are section 4 (Standley Chasm to Birthday Waterhole) and Section 5 (Birthday Waterhole to Hugh Gorge). 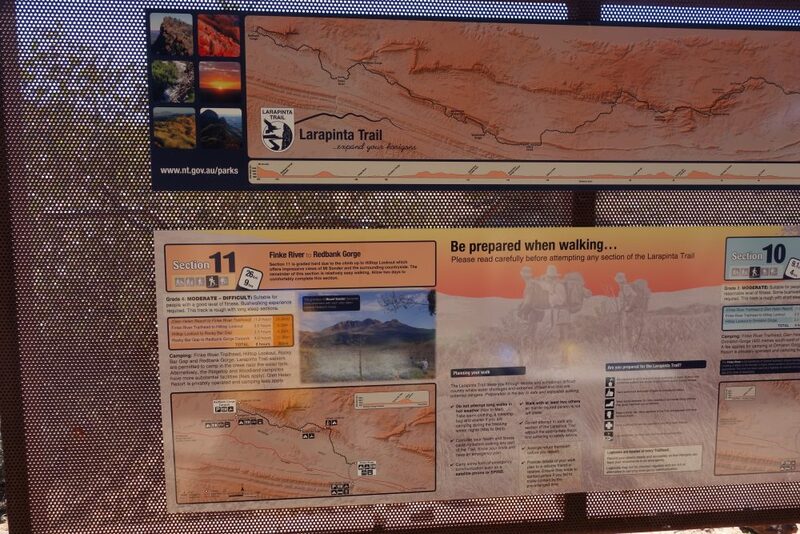 The trail head signs have been updated and vary from the brochures. While both these sections were hard we found that in doing the trip in reverse, and altering the ups and downs, that Section 3 (Standley Chasm to Jay Creek), and Section 9 (Ormiston Gorge to Serpentine Chalet Dam) were now the most difficult sections. This was not just our opinion but also that of those we talked to travelling the same direction as us. 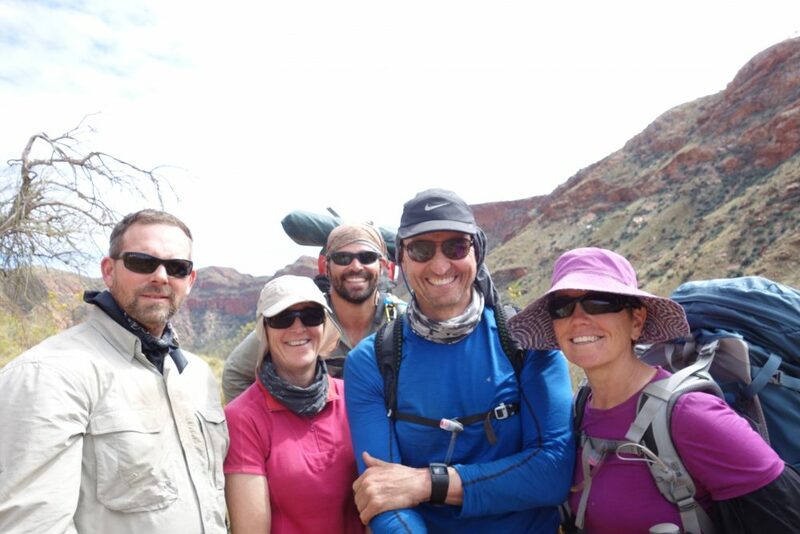 The best sections by far (again not just our opinion) are Sections 4 (Standley Chasm to Birthday Waterhole) and Section 5 (Birthday Waterhole to Hugh Gorge). These sections were hard but the views from both Razorback Ridge and the campsite on Brinkley Bluff were amazing. I hadn’t planned on camping at Brinkley Bluff but with so many people that we met coming from Alice Springs telling us to do so, we changed our plans and were glad we did. Doing both these sections East-West reduced the difficulty and even though I have been a rock climber in the past, I would not have wanted to come down Razorback Ridge due to the amount of exposure. The surprise of the trip was Section 1 on the last day heading back into Alice Springs. Many people choose to skip this section and in some respects I could understand this if it was the first day and you were short on time. However the view back toward Alice Springs from Euro Ridge is stunning and most welcome after two weeks of hiking. While there wasn’t any part of the Trail that I would class as being the ‘worst’ there were two sections about which you need to be aware. The trail is constantly being upgraded however the downhill switchback section from ‘lookout’ to Waterfall Gorge (Section 9) is in very poor condition and footing is treacherous. It is likely that this will be repaired within the next year or so but worth checking with the parks authority before you go. The other section to watch out for (and potentially one of the most dangerous on a hot day) is Section 6 (Ellery Creek to Hugh Gorge 31.2km). We did this section in two days and reached the saddle on Heavitree Range on day one of that leg by about 9am before descending down on to an open plain that had very few shade opportunities. This was the only part of the whole trail where I found myself overheating due to lack of shelter opportunities and resulted in a large number of breaks anytime we found shade to allow us to cool down. Prior to starting the trek we both had preconceived ideas about what we would find. We expected to see very few people but we were wrong as we encountered a number of people travelling in both directions taking anywhere from 12 to 20 days to complete the trail. The majority of these were travelling east-west. We also expected to see lots of wildlife and again we were wrong. Apparently all the poor little creatures found it too cold although in all fairness the bird life was pretty amazing and we did see the odd Euro (part of the kangaroo family). Other hikers that we were leap frogging with also came across the odd (poisonous) snake. Although the trail is short (relatively speaking), we expected it to be demanding – we were spot on there. We expected amazing landscapes – again spot on. We over catered for food and it appears that just about everyone does that. Even allowing for doing the trail in a day less than we had planned, we still left food behind. We expected rocks – that’s an understatement. I have hiked in a number of places around the world and never walked over so many rocks on a trail that doesn’t contain fields of talus or scree. The people on the trail were all friendly and I suppose given that we were all there doing the same trip, you would expect a degree of compatibility. We started the trip with just the two of us but by Section 6 were travelling as a group of three when Steve, whom we met a few days before joined us. We finished as a group of three on the last day and have made a new friend out of the experience. You can hear Steve as well as others describe their experience in Episode six of the podcast. We had planned for this trip to take 15 days based upon the agreed parameters. I hadn’t allowed any rest days but did plan a number of relatively short days to make allowances for any injuries or unforseen circumstances. What we found was that on a number of days we had reached our goal prior to lunchtime and decided to press on. I originally hadn’t allowed doing any side trips but when we reached Ormiston Gorge a day ahead of schedule we decided to do the Ormiston Pound walk in the morning and rest for the afternoon. For fit experienced hikers, a 12-15 day itinerary is very manageable. 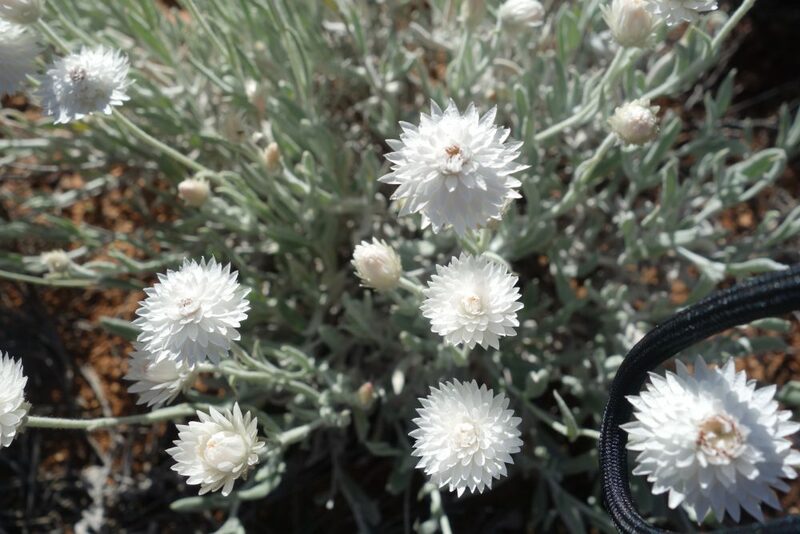 Alternatively you can also allow up to 20 days if you want to do all the side trips or just want to stop and smell the roses, or in the case of Larapinta the wattles. I must also mention the wide range of pack sizes (and loads) that our fellow hikers were carrying. The smallest pack that I saw on the trail was a 38-litre pack and the largest up around the 100 litres. Loads also varied greatly. I’m in the process of becoming a lightweight/ultra light hiker and for me this is a work in progress as I replace gear and learn what I can do without and I’m always interested in talking to other hikers to see what I can pick up. My maximum pack weight, unless I was carrying two days of water, and including four days of food was just under 15kg (33 pounds). Pack weights seem to be a typical conversation on the trail and some hikers indicated they were carrying as much as 34kg (75 pounds). From my perspective there isn’t a right or wrong amount of gear to carry provided what you carry makes you a safe hiker for the given trip but it was apparent that some people were being impacted by the weight that they were carrying. 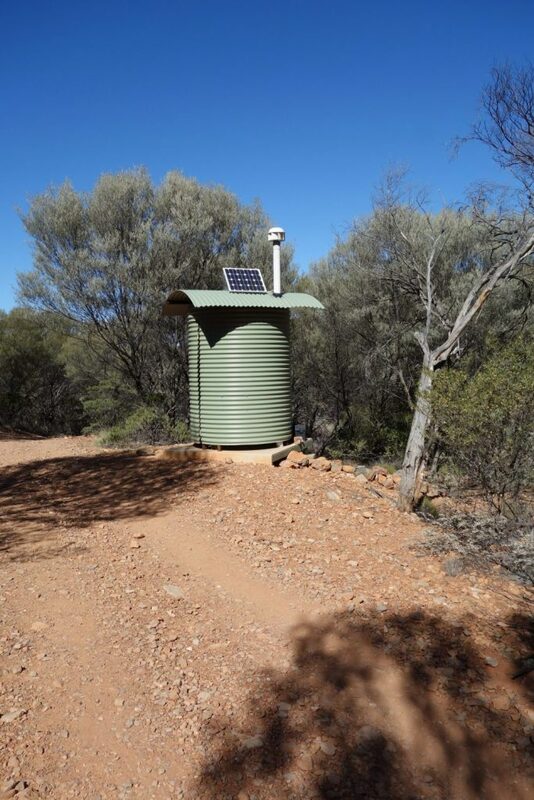 I’ll discuss this in more detail in an upcoming Australian Hiker podcast. One last quirk of this trip that I must mention is the Australian census, which the Australian Government conducts every five years to gain a better picture of the population and its needs. We dutifully filled out our paper copy at Fringe Lily Creek on the designated night to much mirth. Location? 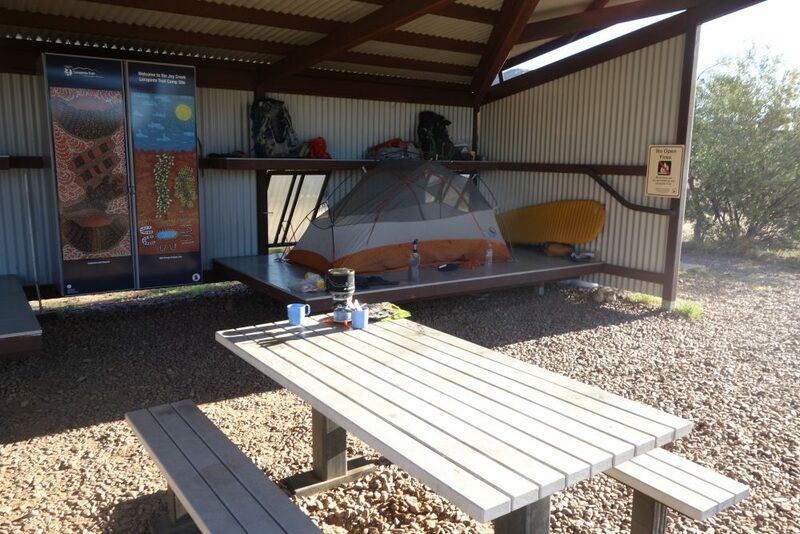 A teeny weeny tent at Fringe Lily Creek, Larapinta Trail, NT. Number of people in your residence on the night? 2. Do you own your residence (said tent) or is there a mortgage? …..I was really tempted to say we had a $10 mortgage on the tent! 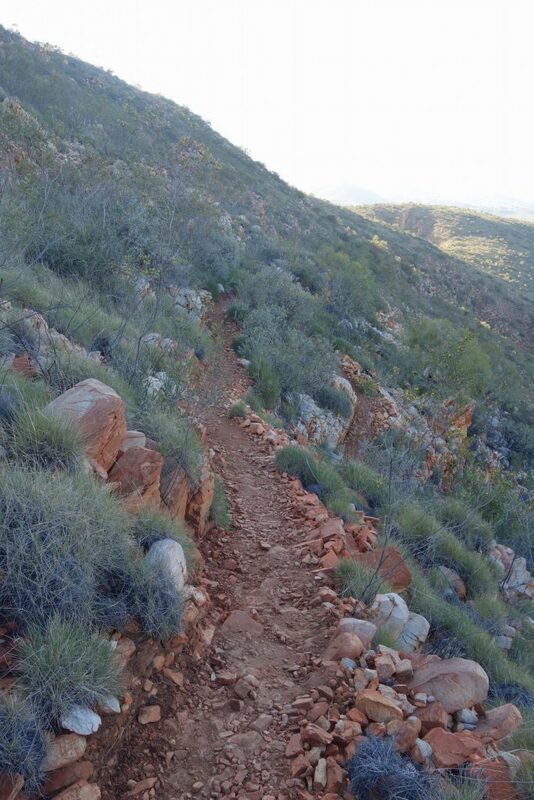 So would I recommend hiking the Larapinta Trail to anyone? Without a second thought my answer is yes. It is challenging, it’s primitive, it allows you time to escape the modern world, and the views are stunning. It’s just plain life affirming, so get out there!